Any of various composite plants of the genus Helianthus, as H. annuus, having showy, yellow-rayed flower heads often 12 in. (30 cm) wide, and edible seeds that yield an oil with a wide variety of uses. 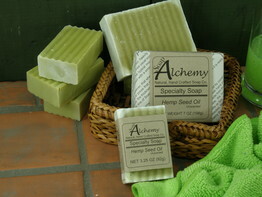 Our specialty vegan vegetable soaps are made from a combination of vegan oils. For example, Organic Fair Trade Shea Butter, Hemp Seed Oil, Cocoa Butter, Avocado Oil or Neem Oil. Each is known for different properties. These speciality oils and butters are blended into great bars of soap, bringing together the richness of exotic oils into your soap bar. Fair Trade Organic Shea Butter, known for its rich moisturizing properties. Hemp Seed Oil, known for its Essential Omega Fatty Acids. Neem, the best oil, from India, used for thousands of years. 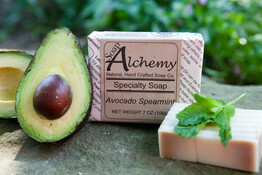 Avocado oil, rich as food and rich in a bar of soap. 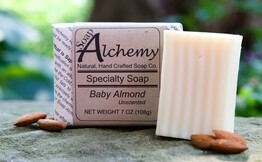 Sweet Almond oil, known for its gentleness. Each group of soaps represent a balance recipe. Balanced for different peoples skins. 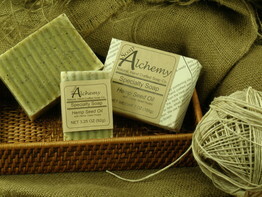 Soap Alchemy offers a wide range of soaps, different recipes for each, brought to you as Specialty soaps. 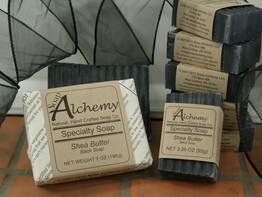 The Shea Butter Black soap, made with vegan USP Food Grade activated charcoal, one of our top selling soaps. 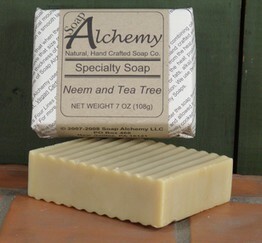 The Neem Seed and Tea Tree Oil soap, great for that difficult skin. 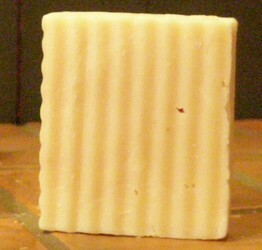 A wonderful unscented bar of the finest oil combinations. A base of Almond, Apricot and Avocado oils, known for their wonderful cleaning yet gentle moisturizing effects. This combination is enhanced with cocoa butter, grape seed and safflower oils and Organic Jojoba oil to round it out. 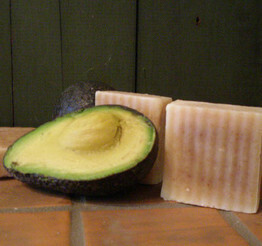 Avocado is used in many cosmetic products for its skin healthy nature. So, we decided to try a bar with Avocado oil as the main ingredient. We added cocoa butter, palm kernel, coconut and Joboba of course. Then the refreshing feel and scent of spearmint, not too strong, gentle and present. Dead Sea Mud Speciality Soap, a top selling specialty, in a soap bar! Works great on oily skin, helps with make-up removal and just a pore detox treatment. 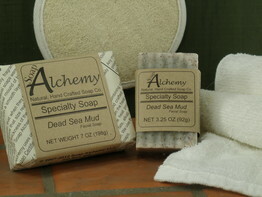 A quick way to get a Dead Sea Mud Facial treatment in a speciality soap bar. Mud from the Dead Sea, brought together with Organic Extra Virgin Olive Oil, Organic Jojoba. A rich lather backed with the power of the Dead Sea, in a bar for you. Dead Sea Mud, loaded with minerals from the Dead Sea, infuses your skin with the minerals, resulting in softer skin. For people with dry skin, we suggest they follow up with our Shea Body Butter blend. The Dead Sea Mud is blended with Organic Extra Virgin Olive Oil, Cocoa Butter, Jojoba and other fine oils. 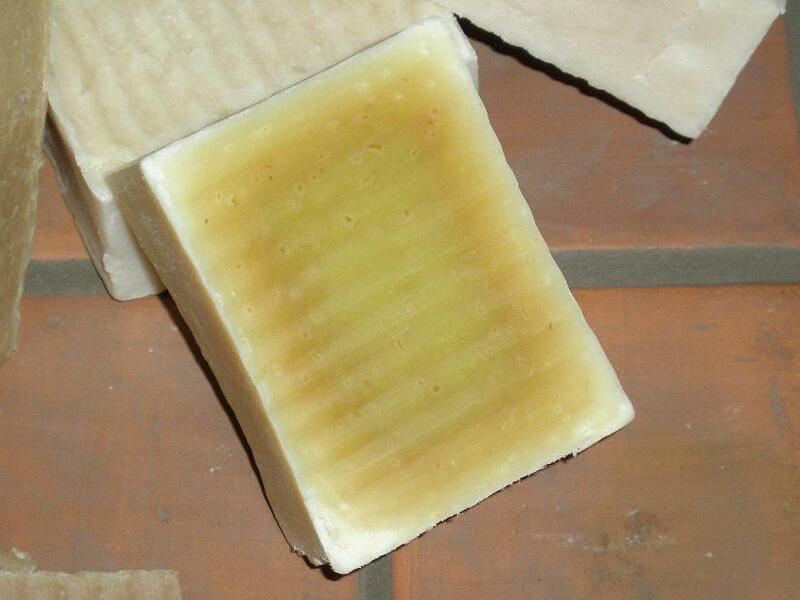 This bar is pleasantly scented with Essential Oils of Rosewood, Clary Sage, Eucalyptus Radiata and Cajeput. This blend of essential oils is designed to help sooth skin. Speciality Dead Sea Mud soap, one of our best and top selling soaps, great all year round. Shea Butter Activated Detoxifying Charcoal Soap, a top selling bar, for a youthful complexion, purifying with USP Vegan Food Grade Activated Charcoal. 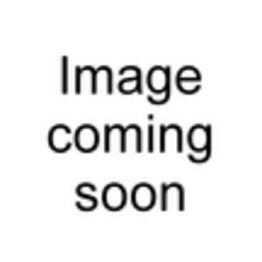 African Black Soap uses Charcoal. Activated Charcoal is a high grade version of charcoal. Sometimes you will see Raw African Black Soap, which is the same as a charcoal soap. Activated Charcoal is a widely know filter agent from vegetable source. Activated Charcoal is used in water filters, air filters and in many other applications. Combined with our Shea Butter moisturizing soap and you have a detox bar. Best results when lathered on skin and left on for 1 to 3 minutes, giving the USP Vegan Actived Charcoal time to detox your pores. Rich Fair Trade Organic Shea Butter and cocoa butter as the main ingredients along with organic extra virgin olive oil, palm kernel, coconut and Organic Jojoba oils makes for very nice rich lather. No fragrances or essential oils have been added as most people request this way. Shea butter is known for its moisturizing qualities and so our bar uses 35% Shea butter, making it the primary ingredient. 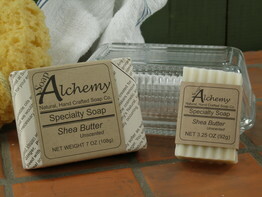 If your comparing Shea butter soap bars, you will find most have only a small amount of Shea butter in them. Look to see where Shea Butter is in the list of ingredients. This Shea Butter, with Organic Fair Trade Shea, has Shea Butter as the first ingredient. Note, this soap is black and it will stain clothing and wash cloths. It is one of our top and best selling speciality soaps. 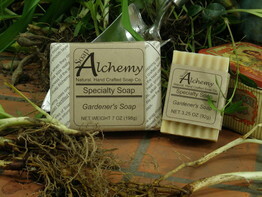 Gardener's Soap is the best choice for the gardener to wash with when they finish up outside. Also perfect for hikers and campers. 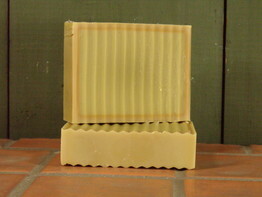 Gardener's Soap is made with Neem oil, a wonderful oil from Africa. The Neem tree, a tropical evergreen, leaves, bark and oil contain compounds with proven antiseptic, antiviral, antipyretic, anti-inflammatory, anti-ulcer and antifungal properties and has been used for centuries. Tea Tree, or Melaleuca Tree, produces a wonder oil known for its healing qualities. It is believed to have Anti fungal Antiseptic, Anti microbial and other properties. These two great oils, along with Extra Virgin Olive, Hemp Seed, Grape Seed, Cocoa Butter, Palm Kernel and Coconut oils produces a wonderful bar. Its great all over your body but even more so after gardening. The scent of the bar is strong while washing but vanishes by the time you have dried off. The scent is from the Neem Seed Oil and Tea Tree Essential Oil, giving this bar what many people refer to as a medicinal scent. This is a popular bar, with many reordered. Our Hemp seed bar is largely hemp seed oil, along with grape seed, cocoa butter, palm kernel and coconut oils, making for a very rich gentle lather. We have added Rosemary essential oil, giving you an all around clean and natural feeling after washing. Our Hemp seed bar is largely hemp seed oil, along with grape seed, cocoa butter, palm kernel and coconut oils, making for a very rich gentle lather. One of the best moisturizing bars and being unscented, everyone can use it. Our Hemp seed bar is largely hemp seed oil, along with grape seed, cocoa butter, palm kernel and coconut oils, making for a very rich gentle lather. The Hemp Seed Husk make this a great exfoliating bar. Scented with essential oils of Rosewood, Clary Sage, Eucalyptus Radiata. A rich Fair Trade Organic Shea Butter, cocoa butter and babassu oil as the main ingredients along with organic extra virgin olive oil, palm kernel, coconut and Organic Jojoba oils makes for very nice rich lather. Shea butter is known for its moisturizing qualities and so our bar uses 35% Shea butter, making it the primary ingredient. 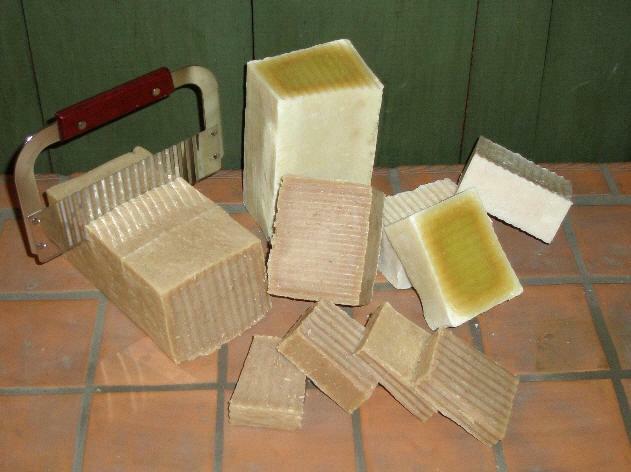 If your comparing Shea butter soap bars, you will find most have only a small amount of Shea butter in them. Look to see where Shea Butter is in the list of ingredients. Scented with Lavender Essential Oil. Lavender is well known for its relaxing and smoothing properties. Shea Butter Pink Grapefruit Speciality Soap, with Fair Trade Organic Shea Butter, our first ingredient, 35%. Then blend in cocoa butter and babassu oil as the main ingredients along with organic extra virgin olive oil, palm kernel and Organic Jojoba oils makes for very nice rich lather top selling soap. No wonder it is considered a specialty soap. No fragrances or essential oils have been added as most people request this way. Shea butter is known for its moisturizing qualities and so our bar uses 35% Shea butter, making it the primary ingredient. 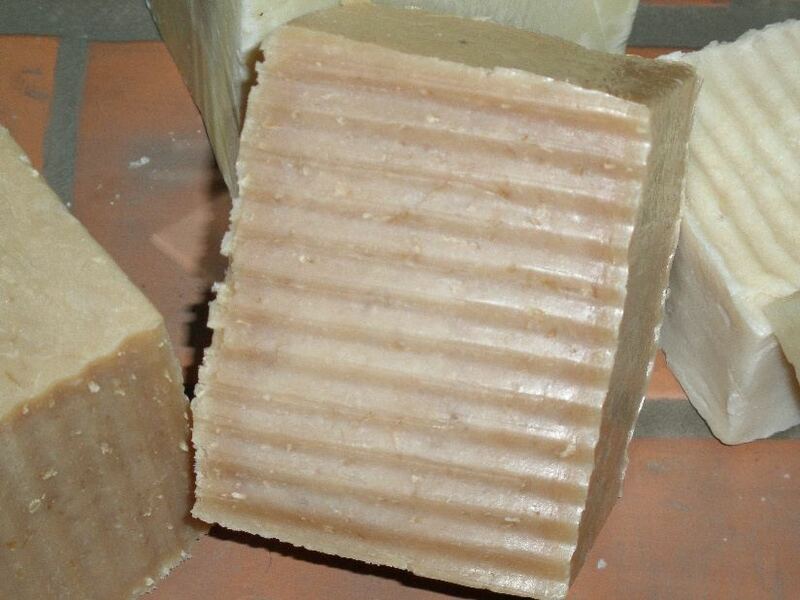 If your comparing Shea butter soap bars, you will find most have only a small amount of Shea butter in them. Look to see where Shea Butter is in the list of ingredients. 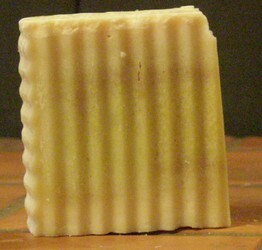 Shea Butter Unscented Speciality Soap, with Fair Trade Organic Shea Butter, our first ingredient, 35%. Then blend in cocoa butter and babassu oil as the main ingredients along with organic extra virgin olive oil, palm kernel and Organic Jojoba oils makes for very nice rich lather top selling soap. No wonder it is considered a specialty soap. No fragrances or essential oils have been added as most people request this way. Shea butter is known for its moisturizing qualities and so our bar uses 35% Shea butter, making it the primary ingredient. 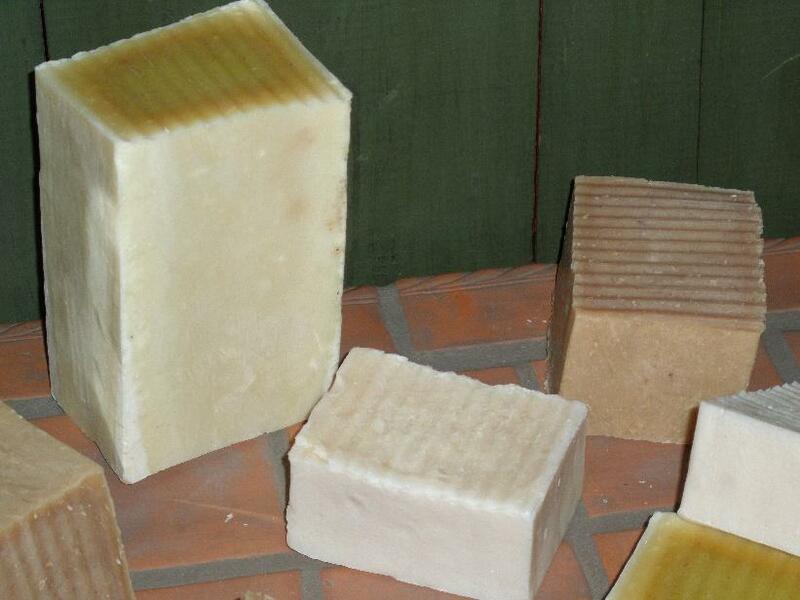 If your comparing Shea butter soap bars, you will find most have only a small amount of Shea butter in them. Look to see where Shea Butter is in the list of ingredients. Clove, spicy, clean and invigorating. Made with Clove Bud Essential Oil. A majority oil of Sunflower seed, rounded out with coconut, palm kernel, safflower, grape-seed oils and Organic Jojoba of course. 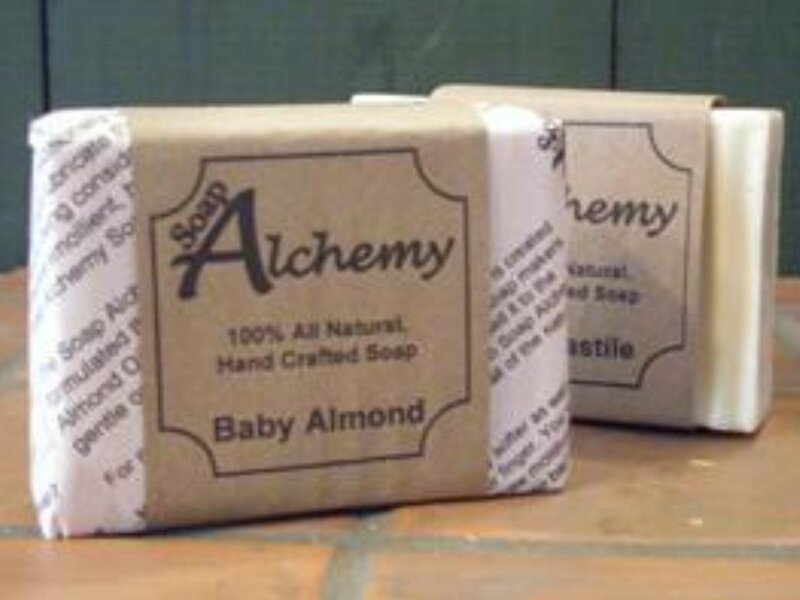 As part of our specialty soaps, we wanted to offer unconventional soaps. 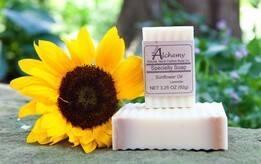 Sunflower is like Extra Virgin Olive Oil in its feel, producing a very gentle lather. A majority oil of Sunflower seed, rounded out with coconut, palm kernel, safflower, grape-seed oils and Organic Jojoba of course. As part of our specialty soaps, we wanted to offer unconventional soaps. 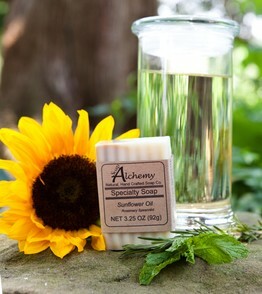 Sunflower is like Extra Virgin Olive Oil in its feel, producing a very gentle lather.